There was to be a break in the storm clouds one evening and this often means good conditions for a nice sunset. So, I headed to a parking garage that overlooks downtown Austin from the East side in hopes of getting something nice. There were a lot of layers of clouds moving around and I didn’t really know what I would get. I was worried about the thick clouds close to the Western horizon as this could block the after-sunset color that I wanted. When I got set up, the sun was dipping beneath the cloud deck and the buildings were nicely lit. I tried many variations on the photo below and I settled on a merge (HDR) of two exposures in Lightroom. I think I got a lot of nice warm tones in the cityscape before the sun went down too low and it all turned to gray. These photos were taken at a really slow aperture (f/16) to sparkle the sun. This also served to highlight every speck of dust on my sensor, which needs cleaning. I spent a couple of minutes in Lightroom cloning out dust dots on the above image. I also had to set the ghosting correction in the merge to be very high as I didn’t want ghost cars on the road below. I got the sun sparkle on the far right, which I think complements the warm green diagonal in the lower left. There is also a lightning rod sticking right up out of the bottom of the picture that I should probably have cloned out. The next picture is just a single exposure, again with a really tight aperture (f/22) to sparkle the sun as much as possible as it peaks through the clouds on the horizon. The clouds were starting to show some color and the sun was about to disappear from view. I also pointed the camera up so that the sky takes up 90% of the photo. I wanted as many of the warm clouds as I could get. As I exposed for the sun so as not to clip out the color, the foreground was very dark. I brought it up in light room quite a lot and it looks kind of noisy as a result. I am looking into getting some graduated ND filters for shooting highly contrasted scenes like this. You can apply a graduated filter in Lightroom, but with the foreground so underexposed it is hard to get clean data in one take without filtering the sky a bit. The sun went down and I waited for the colors to show up in the clouds. I got a little of this, but nothing like what I could see behind me. 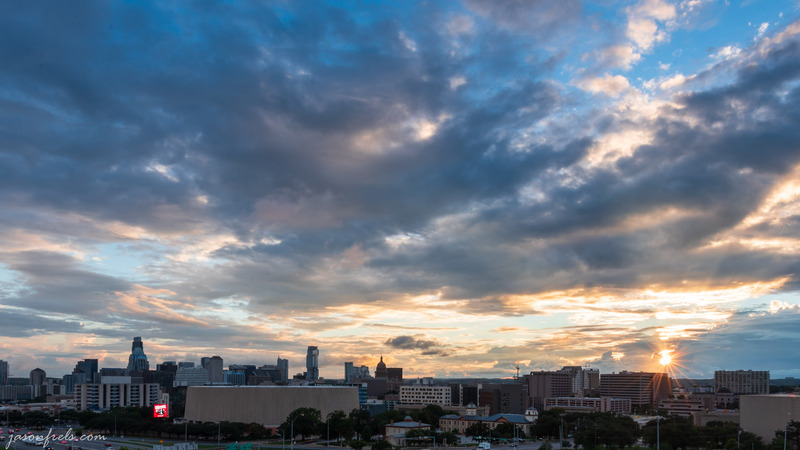 There was such a variation in clouds across the sky that I decided to try to do a panorama. 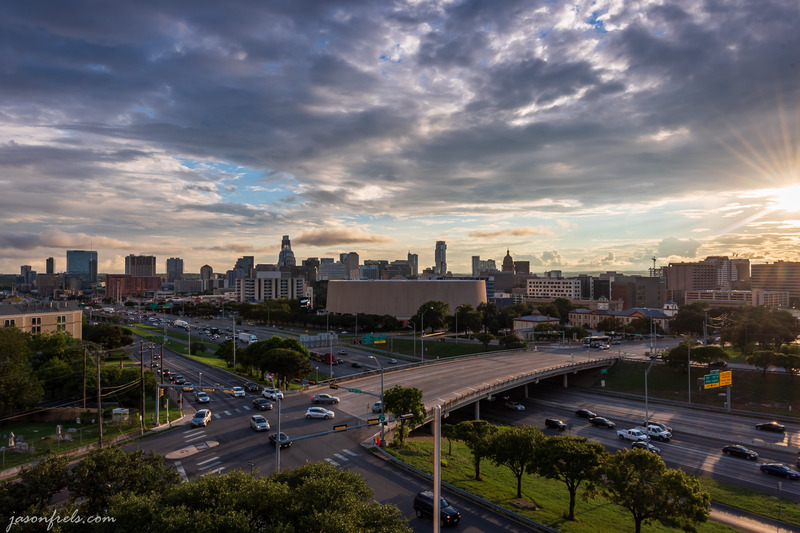 In the image below you can see downtown on the far left and the University of Texas on the far right. This is a panorama stitch of 9 images. I kept the exposure the same in each image and I used f/8 for a good depth of field and minimal vignetting. My tripod doesn’t have a bubble level on it, which would be nice, so as I rotated the camera it tilted a little down hill. I used Lightroom to stitch this all together, straighten, and crop it to a ratio of 7×2. I also took a panorama with my iPhone 8 Plus. This was a bit earlier while the sun was still up. I haven’t played around the panorama feature much on the phone and wanted to experiment. So here you have an iPhone 8 vs DSLR panorama comparison. This was a much wider panorama than the first and very distorted. The concrete barrier in front of me is actually straight. Still fun to play around with. The new iPhones were just announced. I will probably be happy with the 8 Plus for a while longer. For iPhone Xs Max money, I could get a really good lens. Now the storms are back. I hope I get a chance to get out and do some shooting this weekend. Thanks for reading. Leave a comment. Terrific; I’ve been wanting an excuse to get to Austin soon. I was close last week–Marble Falls, Blanco, San Antonio–but not quite. I do most of my shooting west of Austin but work in Austin every day so I shoot there occasionally. I wish there was more public land in this part of Texas to go shooting.